The arch shaped windows in this elegant living room has been decorated with Icy Blue curtains that enhance the look of the whole room. The curtains flow effortlessly and compliment the patterned grey and white couches and matching pillows made of cool fabric. There are mirrored panels fixed in between the windows that reflect the furniture and make the room appear larger. The big window is, no doubt, a very attractive feature of the entire room, but, the Roman shade hung on it enhances its style quotient manifolds. 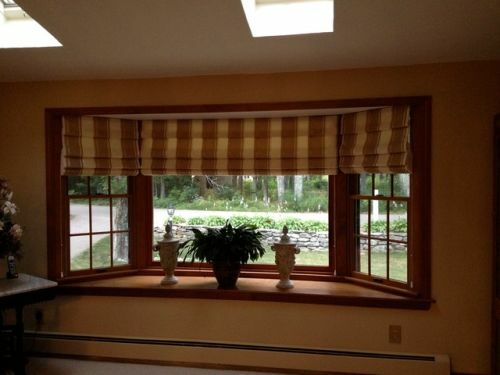 The hobbled shade is patterned with brown and white checks and blends well with the wooden paneled window and the brown colored wall. The shade is just used as a decorative piece and not for covering the whole window and stop the natural light from getting inside. 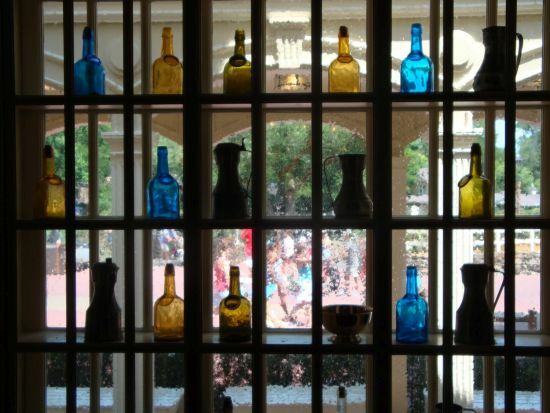 The image shows the window of a house that has been decorated, not with the typically available draperies and curtains, but with bottles that have been neatly arranged in shelves, built as a panel for the window. There are many layers or shelves on which bottles of various colors are placed. One can see through these without being seen from the outside. It looks quite creative and amazing. For a cool summary feeling, one can drape his or her windows with light colored linen curtains that are made of light cotton fabric. 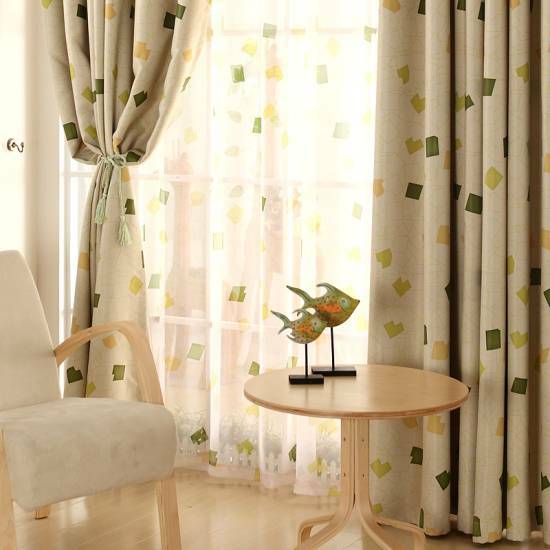 The best part about using cotton fabric is that it allows your room to breathe and adds luster and brightness. 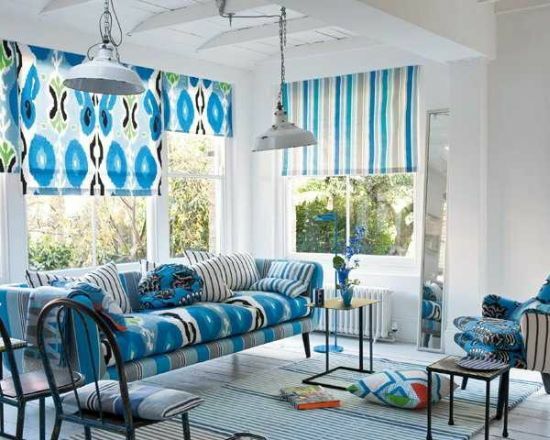 The cool and serene look lent by cotton wins hands down when decorating windows for living rooms. Pennant Valance is widely used to decorate windows of homes as these add style and in many cases also make houses sporty in appearance. Most people tie pennants from rods or felts and let these hang to create a funky look. 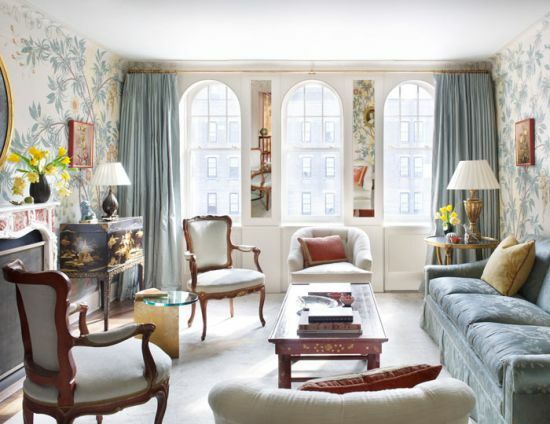 Seen here is an image of a living room that comes alive with the decorated windows that are draped with Pennant Valance and match perfectly with a coordinating window seat and cushions. The window below looks quite trendy with bamboo roman shades hung along with another layer of thick green patterned shade. This creates a double layer that prevents over heating of the room because of excessive sun light. This treatment keeps the room cool especially during summers and also lends a unique look. 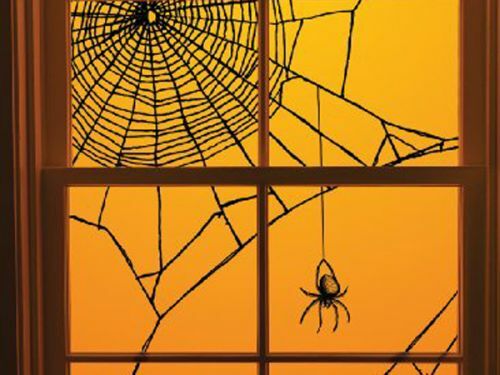 If there is any festival like Halloween approaching, and you don’t know how to decorate your windows, do not loose hope as here is presenting below a cool festive idea that will spook your neighbors and win everyone’s accolades! The spiderweb and the spider can be made at home using tape, black yarn and scissors. The web looks very attractive with a spider hanging. The black offers a perfect contrast when the room gets lit up in the nights. 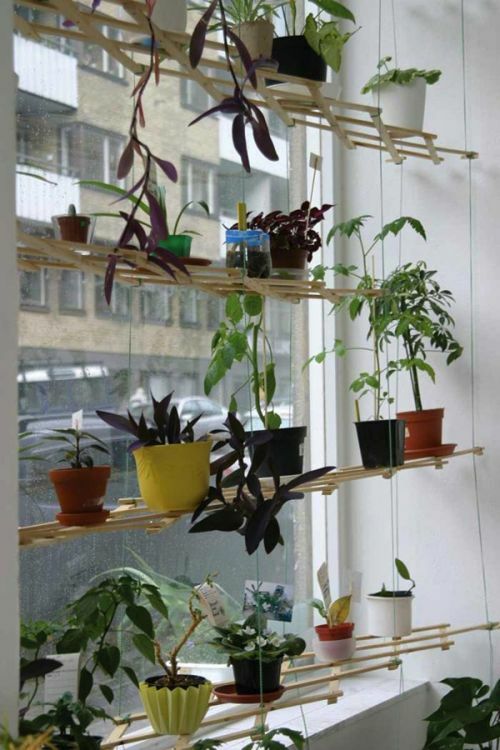 Windows can also be decorated with shelves, using wooden material. The image shown below is that of lattice shelves that look quite charming and on top are placed plant pots of a variety of colors. These pots lend a soothing feeling in the room and also add vibrancy. For those people who like to keep plants can now decorate their windows with these green beauties. 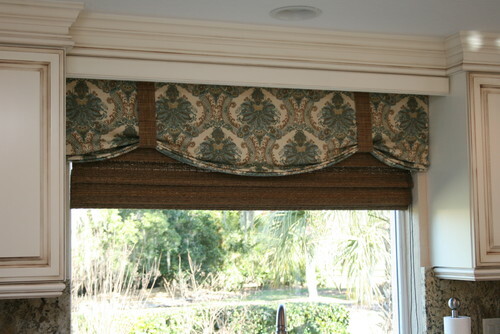 Tassels add glamor to any type and make of curtain. These are objects of beautification of windows and look very elegant. Tassels come in a number of designs and textures like the one seen below where it matches well with the brown horizontal striped curtains and the decor that is white. It creates a classic look for the whole room and makes it appear lively. 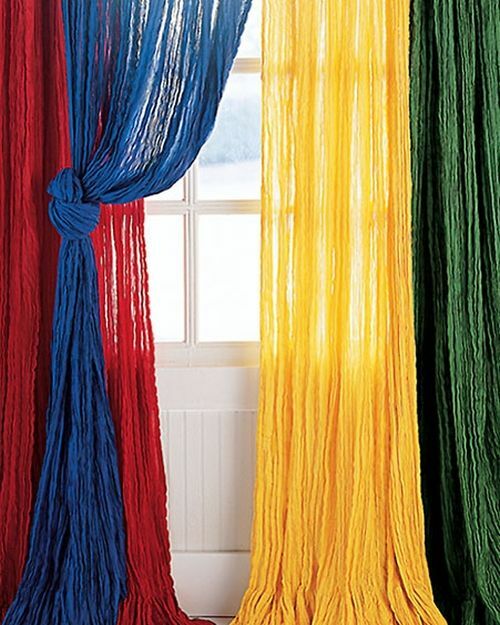 If you wish to bring in loads of colors to your dull living room, you can try out the trick with your curtains first! 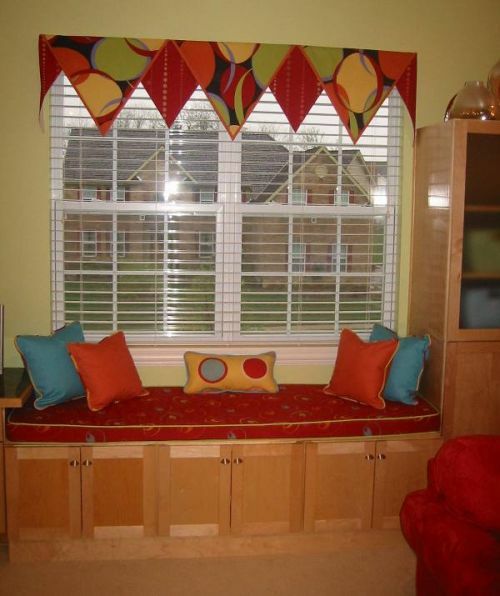 Yes, seen here are curtains of various colors that add glamor and cheerfulness to the whole room. Draping just a single colored shade isn’t enough to create a style statement. You need to blend various hues for getting that chic look. 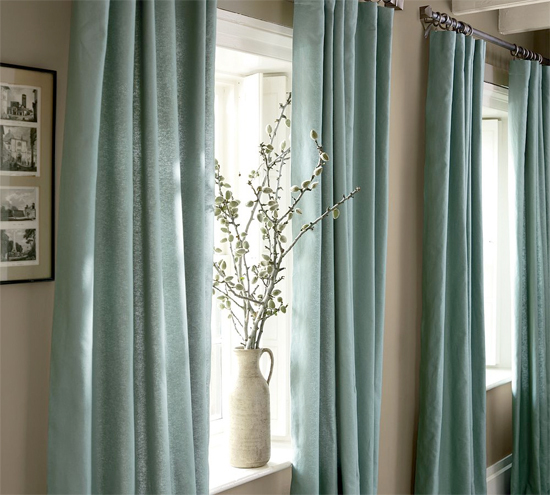 The trick here lies in coordinating two different pattered or colored curtains and draping these to decorate with windows. 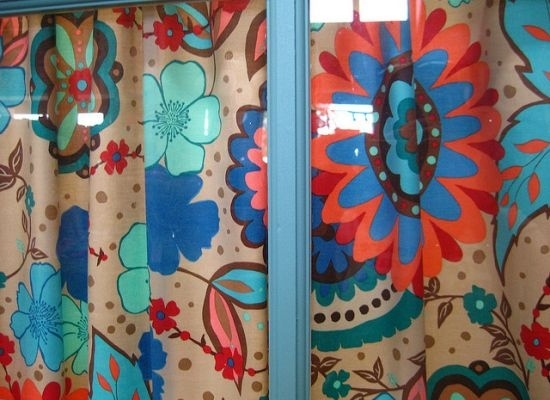 One can either drape curtains that have different colors or have different patterns printed on them. The look created by this mix and match adds elegance and funk to the room. The innovative idea used below makes the room look very airy and spacious with brown geometric curtains layered by similar patterned white draperies. 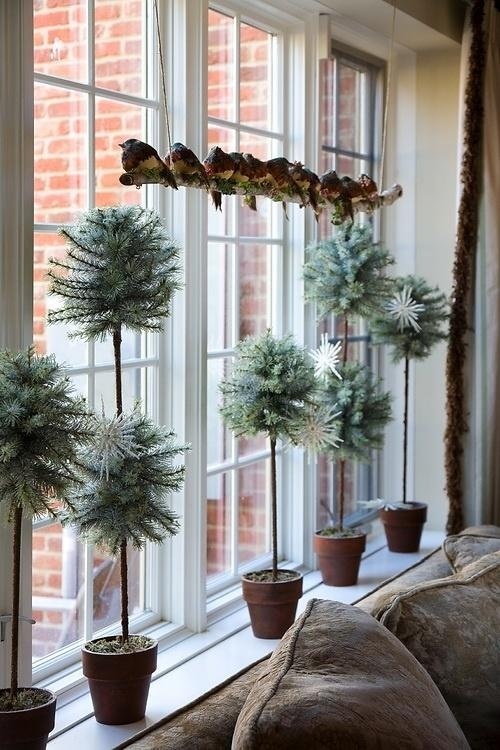 A very innovative idea used to decorate windows of a living room is to place stuffed birds(fake ones of course!!) and together with these cute creatures, put some winter plants in pots. The image shown below is of a house whose windows have been decorated with the same theme and looks very festive. Dry flowers always make for elegant decorative items that can be used in a number of innovative ways, like those that are used to decorate the windows of this house as shown below. 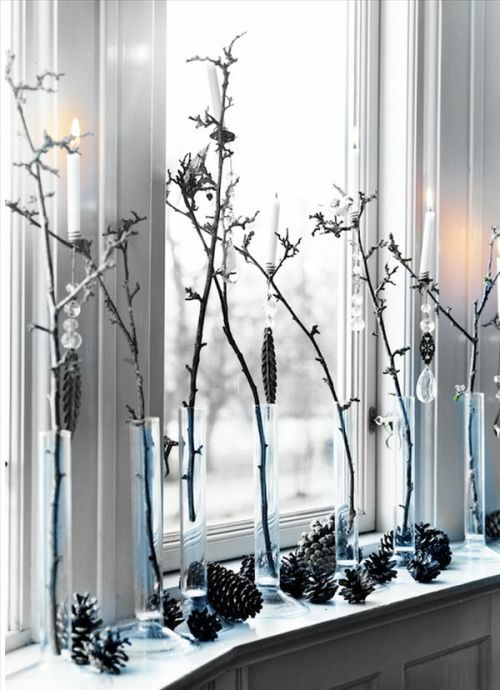 The windows are decorated with glass vases that hold dried leaves of pine tress and also arranged are pine fruits that are wooden in texture and look very elegant. Sometimes, one can alter the very look of how his or her house appears just by adding a striking bold color to the rims or panels of the windows. 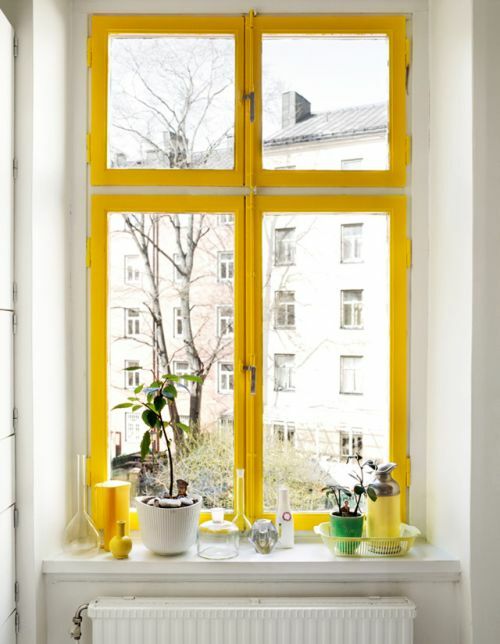 This is what can be seen in the image where the owner has used bold yellow color to paint the rims of the windows to create a dramatic and fresh look. Fresh flowers too can lend beauty, in fact, much more attractiveness than dry flowers because of their fresh color and fragrance. 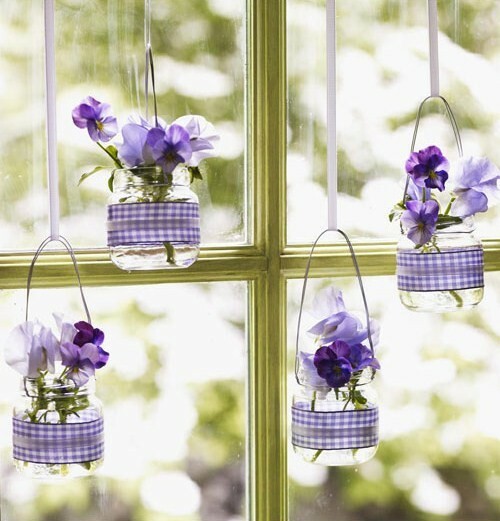 In the image is a window, decorated with fresh purple and lavender colored flowers arranged in glass pots along with silken ribbons holding them. These vases or pots look like gifts wrapped in colorful papers and lend a cool look to the room. 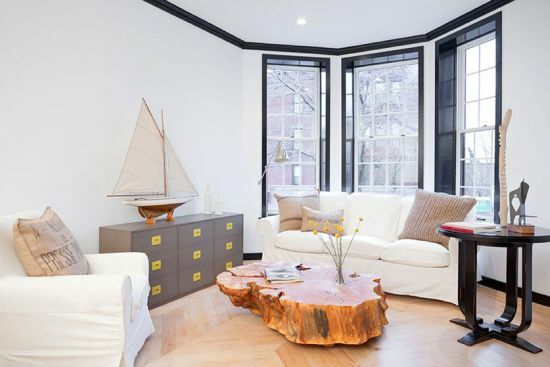 One can add some innovative changes to her living room, starting bang from the windows! 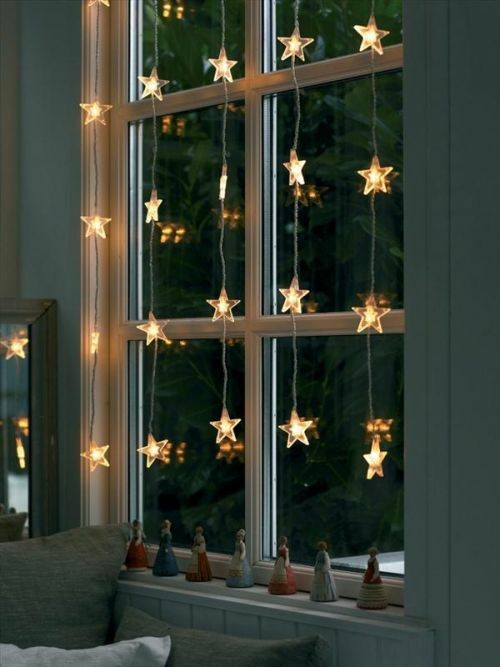 Well, how about chucking the usual kinds of draperies for a change and instead, drape your windows with lights that are shaped as small twinkling stars? The room in the image changes its look with this simple yet fabulous treatment that lends brightness and glow to it. Windows ought to be decorated using the ideas listed above. One can incorporate a number of styles and innovative ideas using imagination and a little creativity. Hope this article has been of some help and would inspire you to decorate your windows the way you want them to. 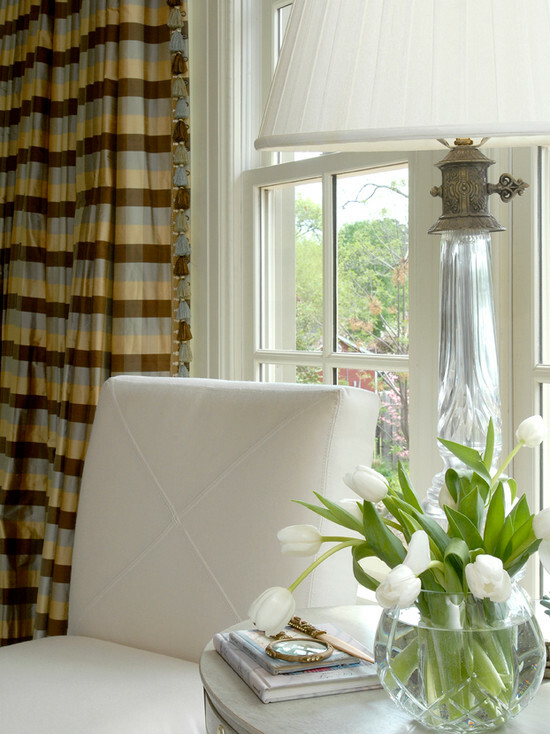 From silken drapery to pretty colorful valances, there are innumerable decorative ideas to choose from. Select the ones that you fancy and get started!